Artichokes are one of the world’s healthiest foods. Yet so many people are unfamiliar with them. 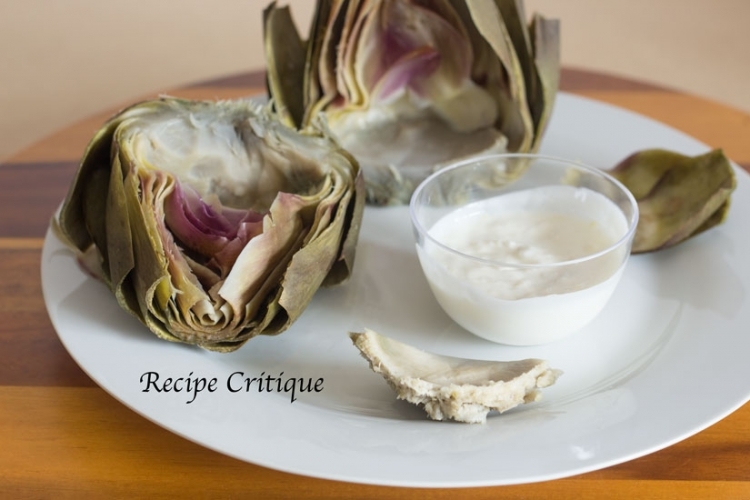 Here we will learn about the heart of the artichoke, learn how to cook and eat them with this easy artichoke recipe. Interestingly enough, it should be noted that although they are long considered a vegetable, artichokes are actually flower buds. Keep reading to learn why you can and should add artichokes to your diet, as well as how to cook and eat them. Spoiler alert; I am not talking about spinach artichoke dips, but the fresh ‘vegetable’ itself. Artichokes are considered a heart healthy food. One medium artichoke has about 60 calories, 6 grams of fiber and 4 grams of protein. Low in saturated fat and zero cholesterol, they are number one in antioxidants and contain healthy prebiotics. One major additional benefit of artichoke consumption is their ability to help cleanse the liver. Artichokes are said to stimulate bile flow, which in turn helps to remove toxins from your liver and out of the body. Artichokes are also said to help with the prevention of stomach ulcers, cardiovascular disease and support healthy eyesight. 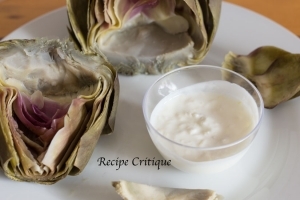 Simple; artichokes can be prepared by either steaming or boiling in a pot of lightly salted water. Prepare the artichoke by trimming the top of the flower buds. Bring a large cast iron pot of water to a boil and add the artichoke. Reduce heat and simmer until cooked. While artichokes can be served whole, the heart of the artichoke is covered in what is known as the choke. This is a fuzzy, almost hair like substance that is best removed. For this reason it is usual to cut the artichoke in half and use a spoon to scoop the choke off of the heart. This is the easiest method we have found for removing the choke before you start eating. Artichokes, for me, are one of the most absolute of finger foods. Served with a healthy dipping sauce they are a pleasure to eat. Sadly a lot of people do not understand how to eat artichokes. To eat an artichoke you will need to use your fingers to gently pull one petal off the flower bud at a time. Dip the base of the petal in your favorite sauce and then put it in your mouth and gently pull it through your teeth. This removes all of the flesh from within the petal. Continue in this manner until you reach the heart of the artichoke, and therein lies the prize. The heart of the artichoke is a very meaty bud at the base of each flower that is amazingly delectable. Dip it, eat it and feel the love. Once you learn about the heart of the artichoke, you will never turn back. Artichokes are destined to become one of your favorite snack items and the best part is that it is so wonderfully good for you. Remove the stems and cut about 1/2" from the top of the artichoke flower. Using kitchen shears trim the tip of each remaining petal. Add artichoke to the boiling water, reduce heat to medium and simmer until cooked, about 30 minutes. You can tell when the artichoke is cooked as the outer leaves will be easy to pull off. 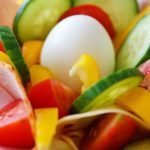 Add all ingredients to a bowl and mix to combine. Keep chilled until ready to serve. 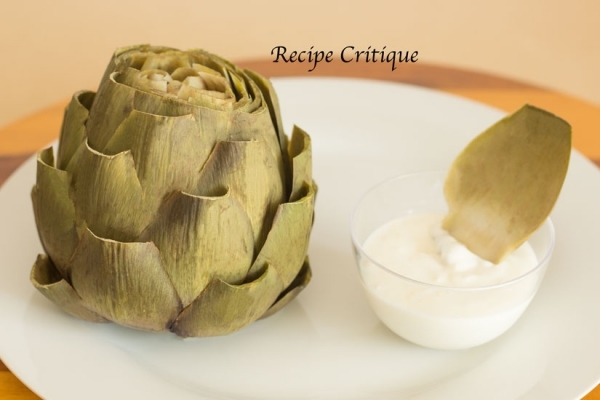 For another idea see this amazing artichoke aioli dipping sauce. Make it vegan? Omit the dipping sauce.